Rays is a young organization with a culture of trust and entrepreneurial mindset. We strive towards solution orientation that allows us to deliver results while still having fun. The collective persona of our company is created by our employees who define our values, who we are & what we aspire to become. Customer focus and experience is what defines us as an organization. We believe in being passionate towards customer needs and serving our society. At Rays, we encourage feedback as a means to improve and appreciate the many authentic long partnerships with our employees, peers, clients, and stakeholders. Our leaders are open-minded, genuinely listen and are willing to examine their strongest convictions with humility. Accountability is what we believe in we set high standards for ourselves. In our bi-weekly fun at work, we encourage employees to explore their fun side through various friendly competitions & festival celebrations. The reach of our HR practices is not only limited to employees at corporate office but also to the remote project sites – We deploy employee friendly policies & processes, seek feedback & accordingly augment meaningful people-centric initiatives. 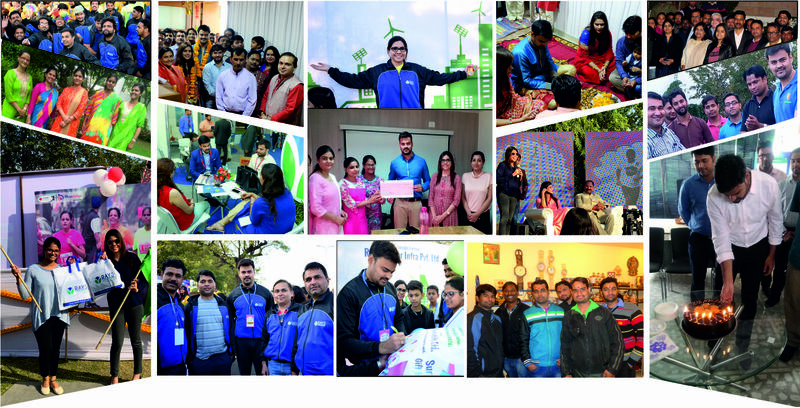 “A leader is one who knows the way, goes the way & shows the way” – keeping at stride with this tandem, a unique initiative of ‘Vartalaap’ with Leadership was kicked off which was appreciated by all Rays employees at projects sites.